Laura Madeline Wiseman was nice enough to ask me if I wanted to be interviewed for her chapbook author series. Thanks Laura! It was a fun process! Principles Of Belonging and Mera Bharat now available on Kindle! My two latest books Principles Of Belonging and Mera Bharat are now available as e-books on the Kindle platform through Amazon! For those of you who have thrown out the old and welcomed the new, here is your chance to order my books! Principles Of Belonging can be ordered here. Mera Bharat can be ordered here. I recently came into contact with an old friend of mine. She was the Best Woman at my wedding — I didn’t have a Best Man. But it has been years since we’ve spoken — more than a decade! Anyway, she bought both my recent books, and write me this note. Yes she is an old friend and that has to be considered, but as she says, she can be critical. She wouldn’t have written what she wrote if she didn’t like my poetry. She would have told it like it is. So I finished your books and I really loved them. And I am not just saying that…I can be pretty darn critical. I thought they were both great but you wanted to know which I liked more and hands down it was Principles for Belonging. I am not sure I can fully express why as I really did enjoy Mera Bharat. I think I liked the different stories coming together in Principles of Belonging. Wow, though. Your work is beautiful and I love hearing your voice in that form! Mera Bharat is now available for pre-order! 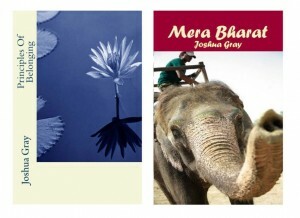 My chapbook Mera Bharat, which means “My India”, is now available for pre-order! 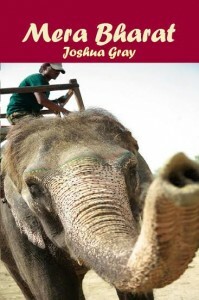 Read about the book and order your copy here! Two books in three months! Woohoo! 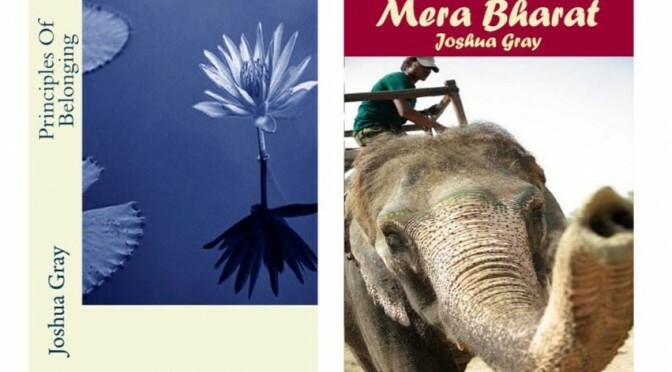 My chapbook Mera Bharat will be available in January! The poems in this collection are about my experiences travelling around India in 1994-95 as well as the last year-and-a-half that I have lived here. Cover photo by DC-area photographer Foster Wiley. This year Durga Puja will begin October 9. Durga Puja is a festival that lasts a week. It is not a huge festival in many places in India, except in West Bengal. In West Bengal, it is a big and exciting time of the year. In 1994 I was privileged to experience Durga Puja in Kolkata (Calcutta). I ended up writing a poem about it. But I wasn’t satisfied. In fact, I spent the next 17 years working on the poem. Rewriting and rewriting. Tweaking really, no major rewrites. Over and over. This was a poem I refused to give up on. As if this week couldn’t get any better, I received and e-mail Tuesday morning (India Standard Time) from the publisher of Z-Composition Elizabeth Akin Stelling (@EAkinStelling), where the poem finally found a home. “Puja” has been nominated for Best of the Net! The poem will also be one of the poems in my forthcoming chapbook, “Mera Bharat”.